Shinsuke Nakamura made an appearance but wasn't able to wrestle at WWE's house show in Tokyo today. 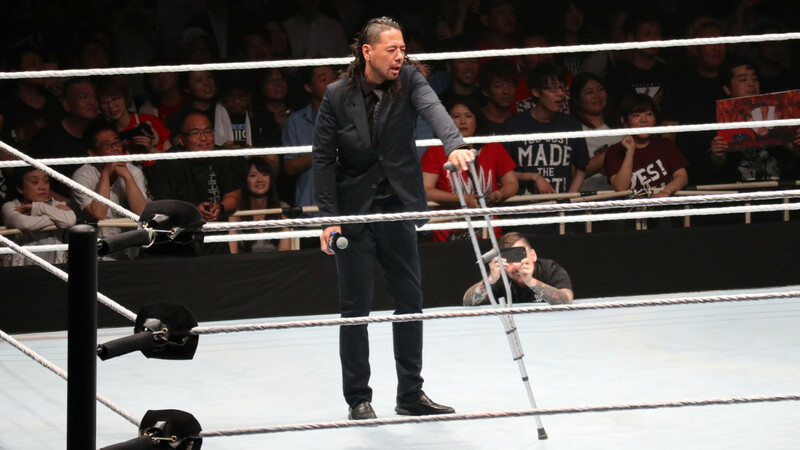 The event at Sumo Hall was built around AJ Styles vs. Nakamura for the WWE Championship, but Nakamura entered with a crutch and told the crowd that he wasn't able to compete. Nakamura was injured when he was bit on the left leg by a police dog at the Rabobank Arena in Bakersfield, California on Monday morning prior to SmackDown's house show at the venue. United States Champion Jeff Hardy vs. Nakamura was then pulled from this past Tuesday's SmackDown. Nakamura was interrupted by Samoa Joe today, who wanted to challenge for the WWE title in his place. The segment led to Joe trying to choke him out, with Styles making the save for Nakamura. Styles retained his championship against Joe in the main event. WWE has another house show at Sumo Hall tomorrow, which was scheduled to be headlined by Styles vs. Nakamura vs. Joe vs. Daniel Bryan for the WWE title. Bryan, who was advertised to face Big Cass at today's show before Cass was released, defeated The Miz instead.